It’s been quiet here recently as we’re still mostly working on getting our fruity Apple & Pear Houses ready over at Rock & Pebble, but I see them all coming together nicely and they might even be ready to ship in less than a couple of weeks now. 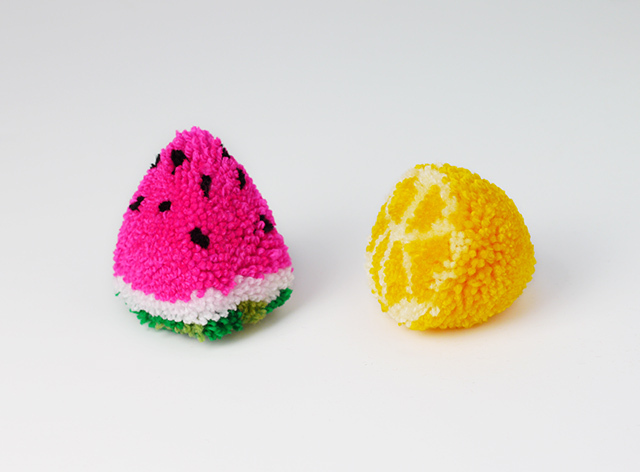 To celebrate, we’re going all tutti frutti this week! Ok, skip the promo (blush!) and now on to the pompoms. If you’re feeling a bit deficient in vitamin C after a long winter like us, this is where we’ll top up our extra fruit portions! 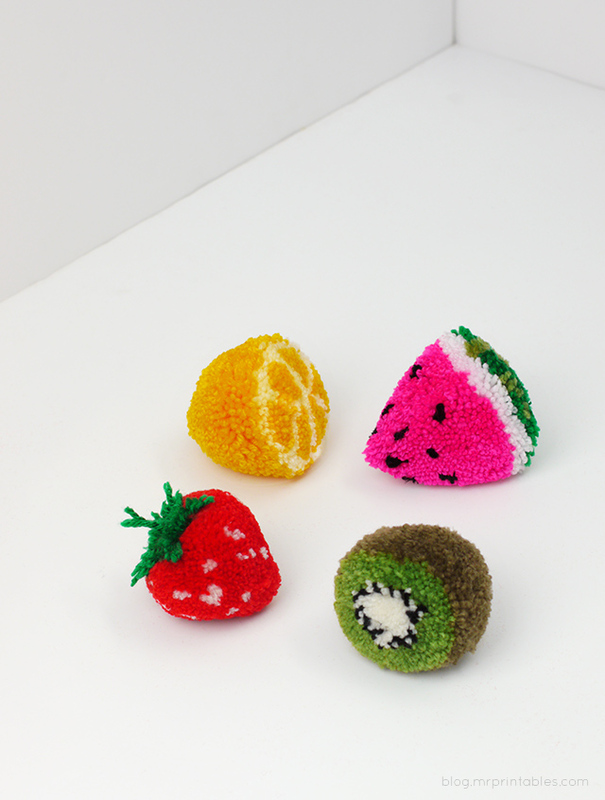 They make great play foods that are soft to hold and colorful to the eye. 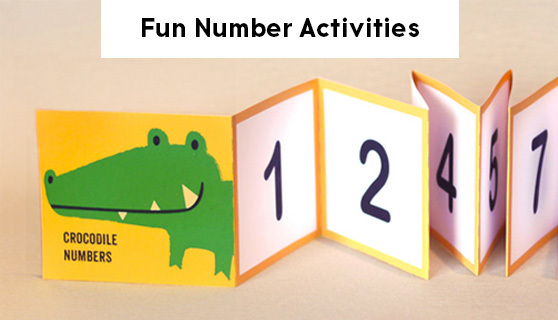 Some designs are very easy to make, so hope you have a go! 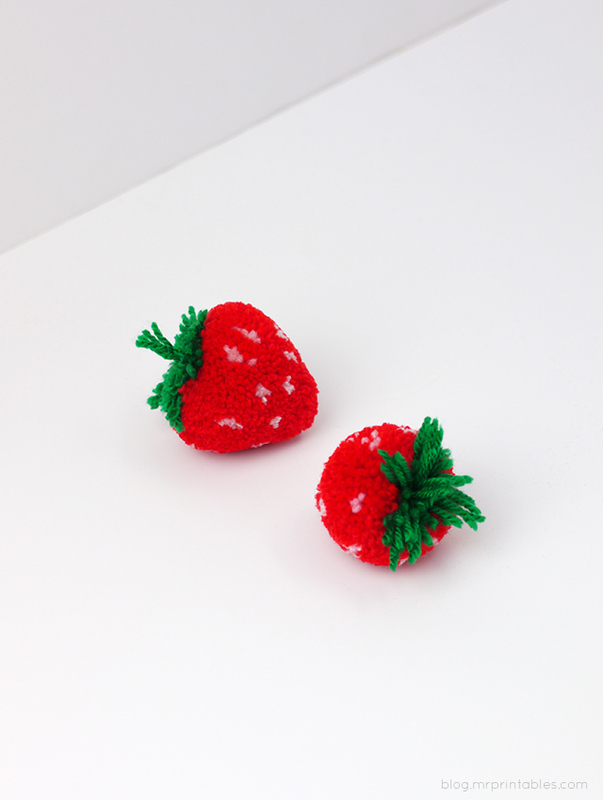 The strawberry pompom is probably the easiest one so you can make a few in no time and kids will love a handful of them. Ok let’s start! As usual, I’m skipping the repeating basic steps like putting two halves of the pompom maker together, cutting and tying. 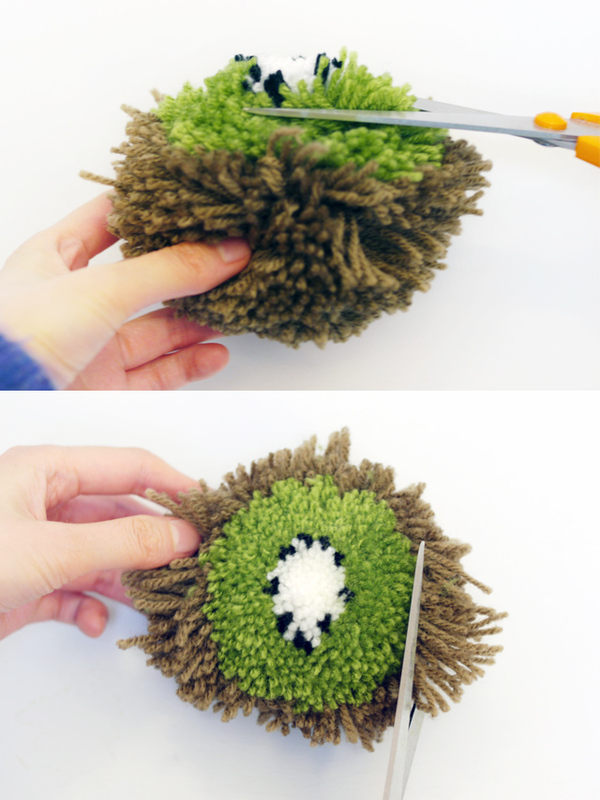 When I say ‘finish your pom-poms’ I mean complete these steps. 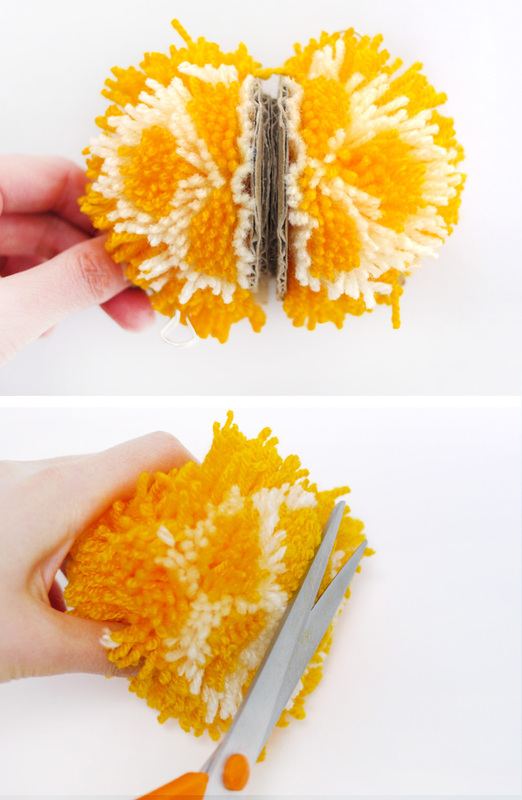 For details, please see this how to make flower pompoms post. 7. 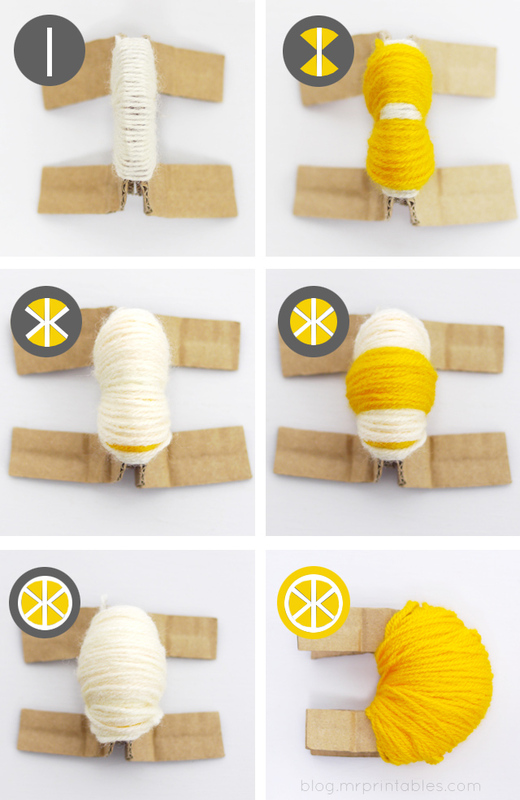 For the second half, simply wrap solid yellow color only. I wanted to make a big big pineapple so I made it from 2 pompoms. You can see that the bottom half shares the lemon techniques and the top is a bit like the strawberry with leaves. I was planning to start by making apple & pear pompoms but somehow didn’t make an apple, got too carried away with tropical fruits. 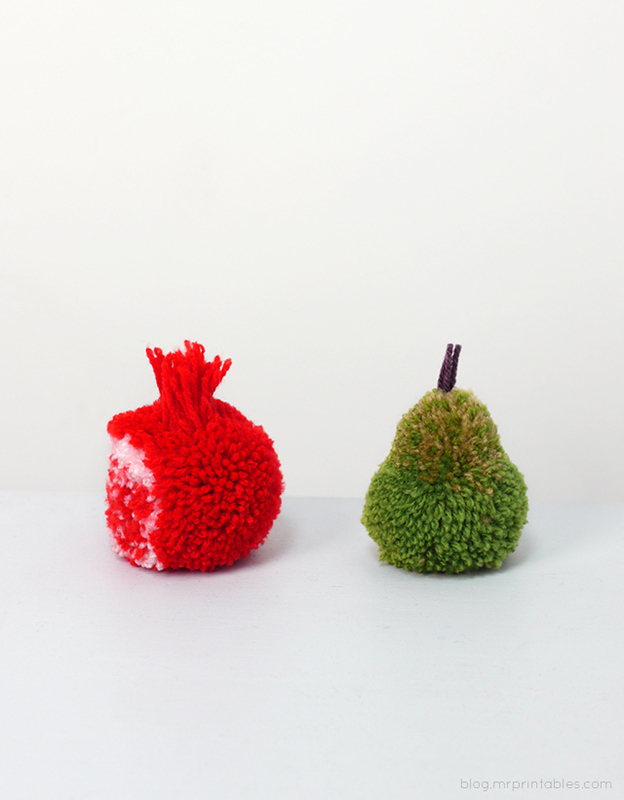 It was going to be a pom pomme. (Leyla’s brother’s suggestion. ^ ^ ) Instead I made a pom pomegranate this time. Now enjoy your Crazy Big Fluffy Fruit Salad! Ps. I know it would be useful to have some more tips and videos but right now I just don’t have the time, too many projects planned! I try to include as much as I can in each post. 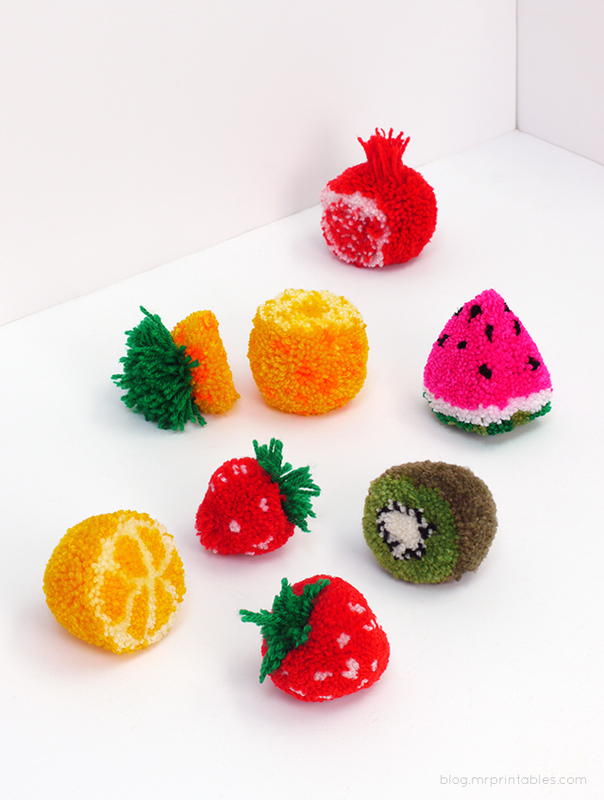 If you love pom poms I have many more planned (with more tips!) so please pop in again. Thanks! 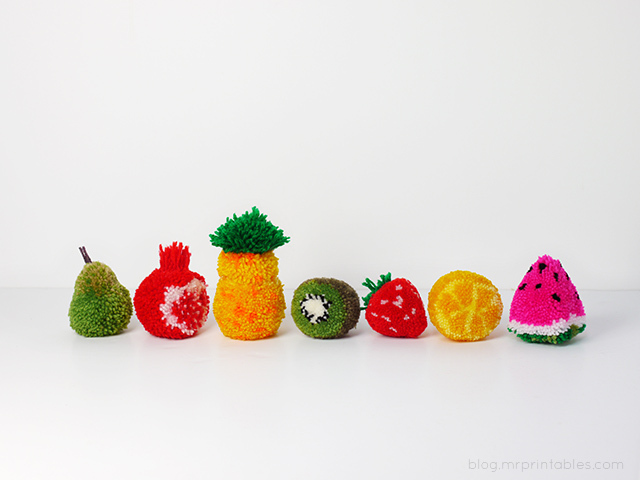 I need to make a Pom Pomodoro too! Thanks Jessica. 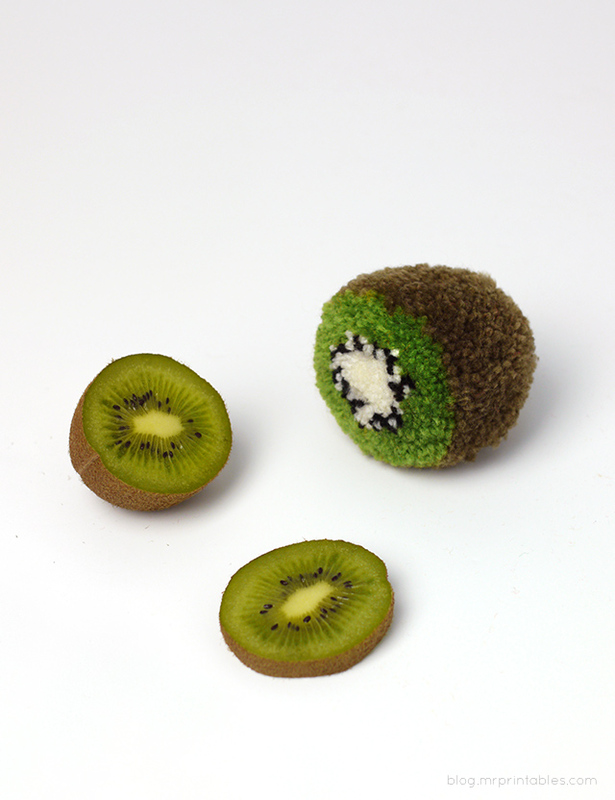 ^ ^ Hope your son will love some fluffy fruit! Can u pls tell me how to tie the two pieces of strawberry together befor cutting. Thank you for sharing these with us, you seem busy so it’s appreciated that you even take this much time to explain the process – even if some of us, myself included, would like more and more tips! 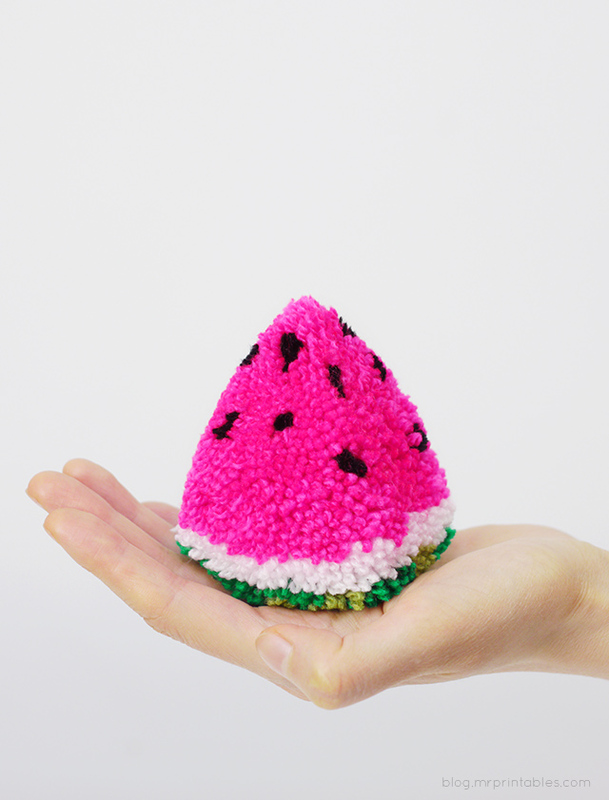 But it is only because you have us hooked on wonderful pom poms! I’m trying to figure out how to make my own designs for poms, and to make my final product as lovely as yours, but I imagine practice will be best for that. 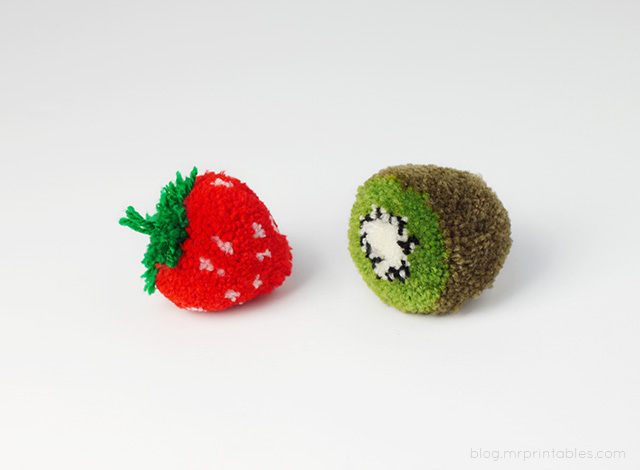 I loved the strawberry pom pom, but can you please just tell me how to trim the yarn off the cardboard? I don’t seem to get it..
Can’t wait to try! Thank you so much! 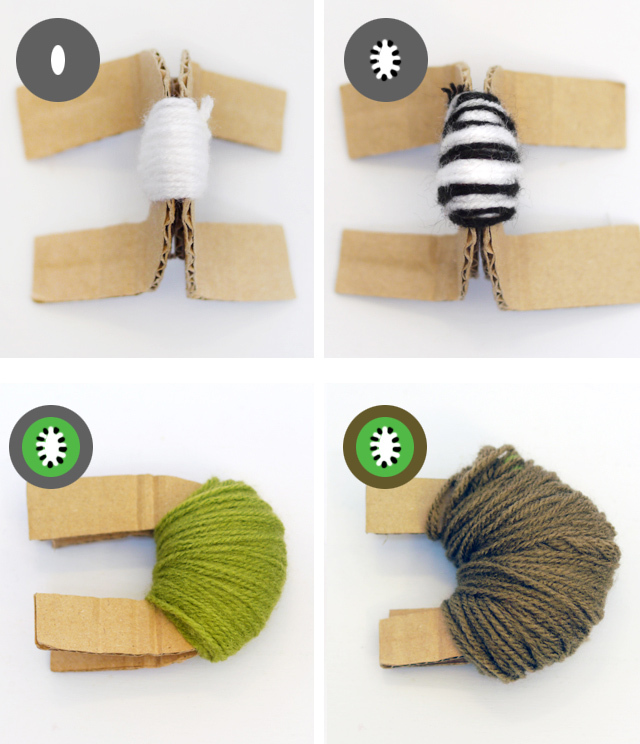 You are so unbelievably crafty – these are AMAZING! Ohmygosh these are the cutest! Can’t get over how adorably fluffy they look! The watermelon is my favorite! These are just all sorts of amazing! Way to go! These are the best thing I’ve seen on Pinterest all week! They are absolutely fantastic!!! Oh my gosh. These are freakin’ unbelievable!!!!!!!! I love the watermelon and kiwi, going to try this out asap! 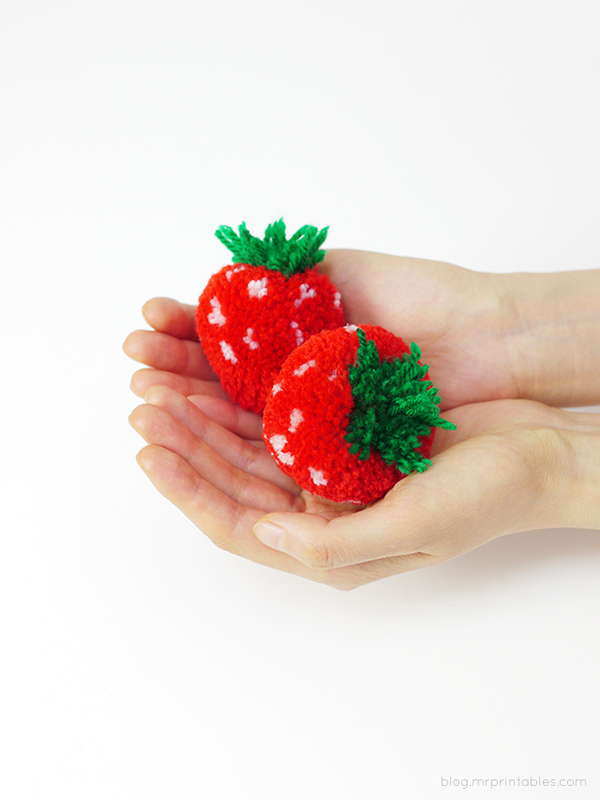 Step 3 on how to bind the two strawberries is missing. I’m not sure how to do it. Wow! So wonderful! Thanks for sharing the how-to! Thanks so much! We made a bunch of strawberries and they are so cute. The kids had a blast. Now they are asking for the pomegranate instructions. Are they available? Thanks again!! I’m sorry, but what’s holding them together? I understand everything except removing it and keeping it together-help someone? So cute! : ) Thanks for sharing!! These are amazing! They would be so cute as a key chain! Will have to get some yarn and make one when I get the chance. Thanks for sharing! They are amazing!!!! Thank you helped me!!!!! My watermelon has not come out well! I’m not sure if I’ve cut it of the cardboard wrong. Any advice?